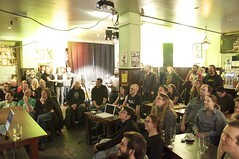 On Wednesday night we ran our music-themed £5 App Xmas Special (fivepoundapp.com). Get to the end of the very last video and you’ll hear a special £5 App rendition of Jingle Bells. Note: I want photos! Email me links to flickr’d images please. I also want your blog write-ups, mail them to me or comment down below. 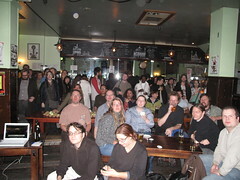 Particular thanks for our sponsors Alan Newman (Sensible Development) and Paul Silver (PaulSilver.co.uk) along with John (psychicorigami) and my ProCasts for putting up cash to fund a few hours of free beer. Also super-huge thanks to the Ribots for supplying piles of mince pies (yummy!) and John for baking a batch of crunchy cookies. The event was organised through Philip and Declan of PlayGroup, they use Hector’s House for arts and science gigs (thanks BuildBrighton for the connection!). Cheers chaps, it was exactly the space we needed! Seb spoke on the highs and lows of forming a band, showed previously-unseen footage and generally gave the lowdown on how it all works. Rick-rolling was included. Seb has his own write-up. Sadly Seb’s hard-drive died after the talk taking all his transcoded footage but on the flip-side Seb inspired Simon to share footage from his old cover band. £5 App #20 “Seb’s Slightly Failed Music Career” for the 2009 Xmas Special from IanProCastsCoUk on Vimeo. 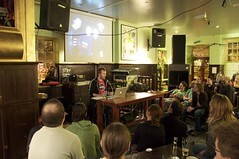 Toby Cole shows the ThereThing constructed through BuildBrighton and unveiled at a live gig the previous month. Sadly the ThereThing is slightly out of shot during the video of the talk but you can hear Toby and see the screen just fine (and the ThereThing link shows it in detail). £5 App #20 “Toby Cole – Zero to Theremin in 20 days” for the 2009 Xmas Special from Ian Ozsvald on Vimeo. Jim Purbrick showed Mrmr, the LiveAPI guitar mounted iPhone Ableton live interface. 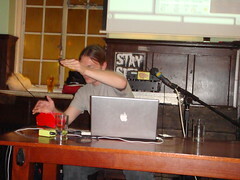 Jim’s also the head of Second Life (UK) and is known for building robots. £5 App #20 “Jim Purbrick – Mrmr/LiveAPI guitar mounted ableton live interface” for the 2009 Xmas Special from Ian Ozsvald on Vimeo. Richard, Sam and Mathias (LastMinute.com Labs) came down from London (thanks guys!) 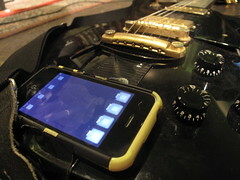 to demo Bottle-Rock-It, a group iPhone musical instrument. The background talk gives loads of detail, sadly the demo went a bit sideways so we sang Jingle Bells as a loud (and slightly tipsy) group instead. Check this BBC News story to see Bottle Rock It in action. £5 App #20 “Lastminute.com’s Bottle-Rock-It” for the 2009 Xmas Special from Ian Ozsvald on Vimeo. 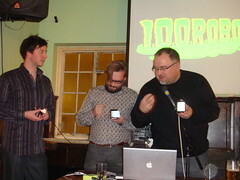 After the talks finished Jim Purbrick and Max went on to play live n’loud as 100 Robots. If you want to keep in touch with future £5 App events then join the £5 App Google Group – it is very low volume and is mostly there just for the announces. We’ll probably run some more competitions next year, the 5k competition went very well and John wants to do more around that idea and I want to play with some open-source A.I. kits. Details to follow. I've got some very shoddy video of Toby playing the ThereThing - http://www.youtube.com/watch?v=3hjKTEB-RvI I'm not up on video editing so if anyone knows a way of making it a bit brighter, I can give them the original file, it's a 20Mb MP4 one. My camera couldn't cope with the low light. I am totally sore that I couldn't make this event in the end! It looks amazing! The wider community of Brighton NEEDS active, skilled, imaginative and cooperative groups like this! Well done y'all.